My imagined time line with Cowboy is not becoming reality. By now, over a month into our relationship, I saw us riding the trails, communicating seamlessly, impressing all our barn mates. But no. He’s had a hoof issue that’s prevented us from riding or working. And before that, the second time I did ride him it was clear we needed a little more ground work to establish which one of us is the leader. Horse trainer Clinton Anderson has a saying: reward the slightest try. Your horse won’t get exactly what you’re trying to teach him all at once. It’s the small advances that eventually yield a large result. Reward and reinforce those small steps. This is completely obvious as a yoga teacher. Of course a student isn’t going to glide into Bakasana on the first go. Start by making the general shape, play with putting some weight into the hands, cruise up to the edge and pause. This process may take months, even longer until the feet float. As a teacher, encourage and celebrate even the smallest markers. Nothing comes all at once. Even if it seems like it does, it’s probably been growing, preparing for a long time. My ego clock has different ideas with Cowboy. Alas, nature and Clinton Anderson and Bakasana teach me to pause, exhale, be grateful, take the long route and relish in small steps. Today I will reward even the slightest try. How ’bout you? Is there a project or part of your life where you’re appreciating the slowness? Rushing along? Do you sometimes have other ideas for the time continuum? He got a jacket. A plaid blazer. He looks quite handsome in it, and being a skinny dude, it will keep him warm and toasty through the winter. Sometimes I tease and call him Rhinestone Cowboy (or RC for short). 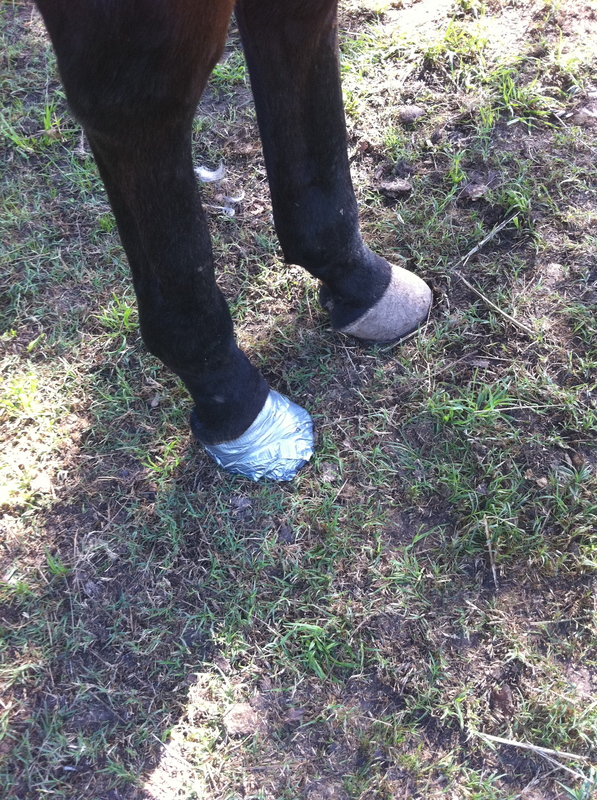 With the diaper and duck tape he’s had on his hoof, he’s been quite the twinkle toes. Our bond is getting stronger, even if I am just The Treat Lady. My mom took this sweet picture of us. Remember, there’s a new website coming soon and you may want to subscribe so you know when and where things move (“Sign me up” at the top right of the page). It will be a refinement of Blogasana with the same types of yum (yoga, stories, poetry), along with more fun and ka-pow. I’m working with Copylicious Kelly, so you know it’s going to be awesome! Yes yes there is! My husband has to retrun to Brazil in a week and a half, but I need to finish my thesis and will be here through May 2011. I want to rush my thesis so so so bad. Thanks for your encouragement and suggestion. I feel like I’m forever struggling with the idea that a baby step is okay. That it’s progress towards a goal just the same. I like the idea of rewarding those small markers. Can’t wait to see the new site! 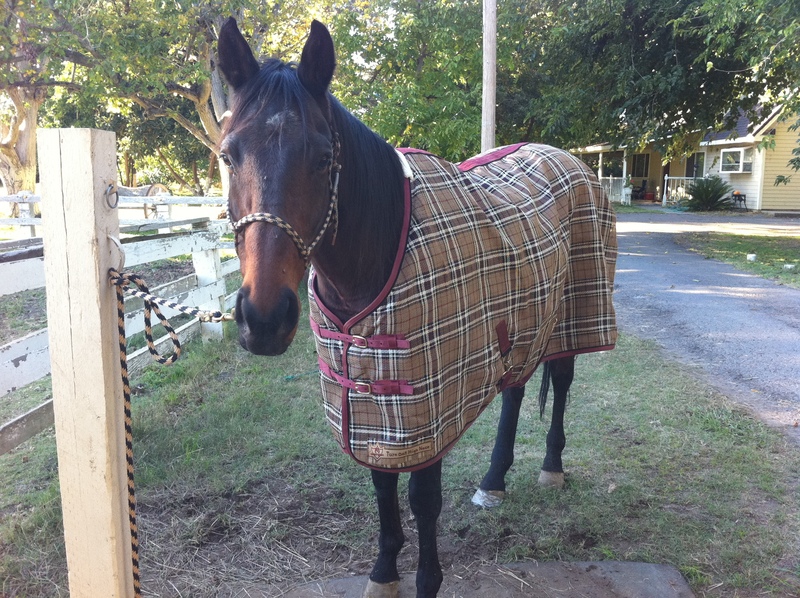 And you know how I feel about horses, but Cowboy looks fetching in his new jacket. I’ve been seeing how totally perfectionistic I am when it comes to writing – which leads to feeling discouraged, giving up and avoiding rather than churn out pages and pages of free-write “crap.” Really humbling to see how many beliefs, fears and blocks I’ve constructed around my own creative expression. And how much I’ve relied on external validation to *move* me and motivate my writing. My baby step is to just start with free-writing. Every day, write for a set amount of time and not worry about form, structure, content, linear sense. Just write and write and see what comes out. Scares the hell out of me! Oh yes, I can totally relate to this one, too. I have so many things I wish I could do and so often it doesn’t happen when I want (or at all). I have been reminded A LOT this year that little steps, or even backwards steps sometimes, are OK because life is just like that sometimes. Think back to when you first got Cowboy and you will see how much progress you already have made. I love that pic of Cowboy in his plaid jacket. I would love to meet him someday. Thank you for encouraging me to get cozy with my edge. but small steps are so much harder to notice, so why bother? small steps are so much less exciting. small steps are not good enough. i’m so glad i found you and yoga. ALL the small steps i’ve noticed and appreciated have been a result of practicing on the mat. and i’ve been much happier and more successful because of it. because of this my work has greatly improved, i’ve stopped demanding perfection from my students are started seeing effort and their small steps. What Tami said. Once again, we’re sharing a brain. And O. M. G., I want a plaid coat just like Cowboy. Fierce! I get this with the pup. Why is it so hard to apply it to myself. Maybe I will pick an area (like painting, so the supplies don’t sit) and practice applying this. 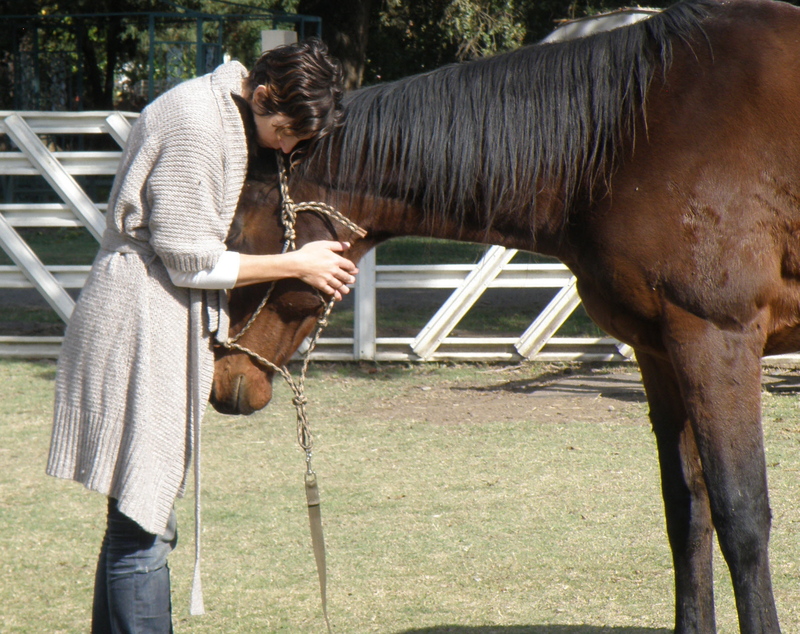 That is a beautifully sweet photo of you and Cowboy. I can feel the love. @jen – man, being in the moment is so hard when you want to be somewhere else! i hope you find some unexpected gifts in this upcoming time of separation with da’man. @amy – i’m with you. maybe we can help each other remember. he is a dapper guy, huh!? @kel – aaaah, the perfectionist! i was reading tara brach last night about how this world is imperfect. and we come with our perfectionist attitudes. it’s just impossible and sets us up for pain. just write, girl! free write your heart out!! @jenna – those sneaky backwards steps. dang it if they aren’t part of the “progress” too! cowboy would love to meet you … and noah! @tami – right? "baby" steps. who wants those?! ah, then along comes the petri dish of the mat. where the tiniest change makes the biggest difference. and thank god. @ryan – it's a *kensington*, which i do believe would be the equivalent of ralph lauren. would look very smart on you. @elizabeth – YES – the clicker! isn't it funny that we can get these things in one realm and be complete space-monsters to ourselves!? the more examples we have, perhaps the easier it will be. Hi hope there have been small steps with my yoga….so slow that balance still eludes me even tho I a wee bit better now and then! Hey you. Since I thought I was sick this spring with cancer I have really taken small steps to be well. I mean this in so many ways. Like I take daily vitamins and try to have at least one serving of fruits and veggies per day. I also try to drink my 8 glasses of water and get my 9 hours of sleep and floss and be kinder to my health both physically and mentally. I also started running again and boy is that a small step process. Now I’m down with a 5k easily and have started running faster. This was a slower process internally because my heart rate was just too high when I ran but it’s coming down slowly and surely like the MD said it would. I’m even lifting weights now but only lower body because I want to start off slow. Progress in changing the body is slow but it’s there and I think it’s longer lasting this way. Don’t even get me started on the progress with yoga. I am always amazed at the little details of each pose that I “thought I knew” before and was just clueless until you stopped by and moved me a slight inch up or back and then I truly felt the pose. Ah, but for the slowness of life. Little steps, big rewards because you’ve had the time to enjoy the process along the way. By the way, love the photos of Cowboy and the one of you and him. It’s so precious. Next post: what does it meeeeean?